In one of my current projects, I’d like to use a few motion or proximity sensors, also known as PIR sensors. PIR sensors, or Passive Infra Red sensors, can be great for Arduino and Raspberry Pi projects, and can be bought really cheap – I only paid about a dollar per sensors in bundle of 10 PIR sensors from eBay, but you can get them really cheap at places like Amazon or AliExpress as well. In this short article we will see how we these sensors work, how the can be used, how we can test them, and possible fine tine them a little bit. No Arduino, Raspberry Pi or anything like that is needed. Just a PIR, a LED, a battery and a resistor. A PIR sensor is an electronic sensor that measures infrared light radiating from objects in its field of view. Normally this type of sensor would be used as a motion or proximity sensor. The sensor in the PIR detects or “reads” infrared radiation “emitted” from objects all around us. Each object with a temperature above absolute zero ( -273.15° Celsius, -459.67° Fahrenheit, or 0 Kelvin) will radiate infrared, even us humans, and even though we mere humans cannot see this. 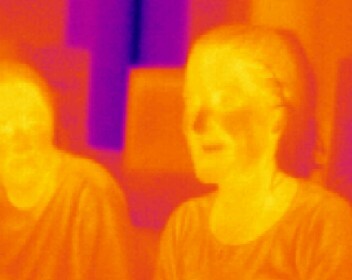 With special Thermal Infrared Camera’s however, this can be made visible to the human eye. Note that the PIR just uses a relatively simple sensor – it is most definitely not a camera! PIRs are called “passive” since they are not assisted by any “helpers” that for example would send some form or shape of “radiation” or “light” to help detect. It’s purely based on what the sensor can pick up out of the environment, what’s being emitted by objects. PIR’s actually only look at the “difference” between two sensor “halves”. If the difference is too high then it will trigger – it detects “motion”. This is done in a smart way, to avoid false positives caused for example by a brief flash or an increase in room temperature. A chip and some discrete electronics handles all this for you. 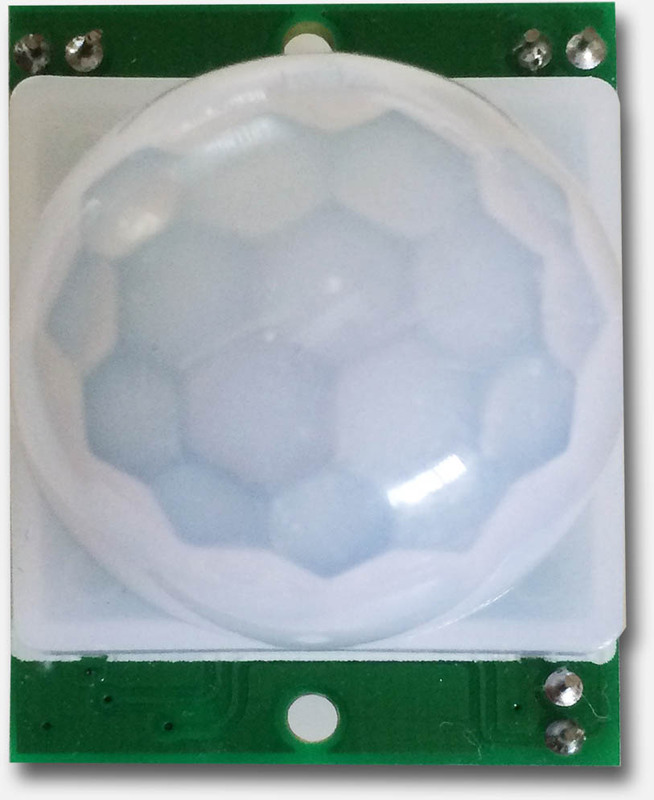 As you can see in the pictures above, the PIR has some funny dome-like bubble, which is a collection of lenses covering the sensor. If you look closer, you’ll see that the “dome” is build out of little segments – each being a small plastic Fresnel Lens. These tiny lenses help the sensor to look “around” in one swoop, which would have been impossible with just the flat sensor (see figure 2). The most important pins are of course Power supply (Vcc 3 to 5 Volts – it is said that this can even be up to 12V) and GND (Ground). The OUTPUT pin is the switching pin. The two potentiometers (orange) allow you to tune Delay time (Tx) and Sensitivity (Sx). If you’d like to experiment a little with your PIR, or test how well it works, then you actually do not even need an Arduino or Raspberry Pi. All you need is either a power source, a resistor and a LED. The power can be drawn from either batteries or a power supply – 3 to 9 Volts will work – I used a 5V USB charger. For the LED, we need to pay attention, since it’s important that we connect the pins right. The longest pin of the LED (Anode, or “plus”) should be connected to the resistor, see the LED drawing below. The resistor should be 470 Ohms, the colors are Yellow, Violet, and Brown (see also the Tweaking4All resistor calculator). Connect the PIR Vcc pin to the + of your power source. Connect the PIR Output pin to one end of the resistor. Connect the other end of the resistor to the long leg (Anode) of the LED. 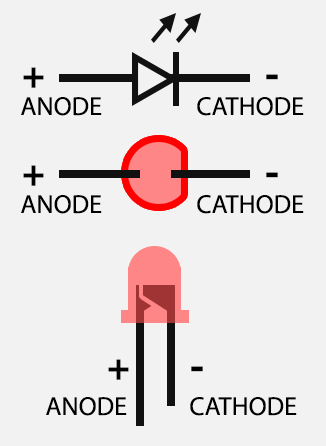 Connect the short leg of the LED (Cathode) to the − of your power source. 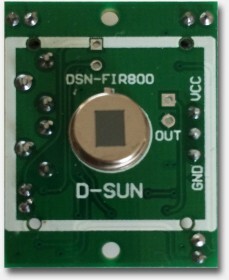 Connect the PIR GND to the − of your power source. p.s. I made this drawing with Fritzing, a great tool to make electronic design! Now that we have a test setup, time to do some playing. When the LED goes on, motion is detected. In the beginning you might notice some seemingly erratic behavior – this is perfectly normal. We need to understand a few things before we can tweak the settings. When connecting the battery, the sensor will take up to 30 to 60 seconds to stabilize (warm up). Place your setup in such a way that there will be no motion and wait until the LED remains OFF. Once the LED remains OFF, you can move your hand or anything for that matter, in front of the little dome, and see the LED go ON and OFF. Depending on what is moving around, the detectable range should be up to 20 feet or about 6 meters. Also keep in mind that the sensor will remain “ON” for a little bit after it detects motion. At a later time you can tune the timing with the “Delay Time” potentiometer. 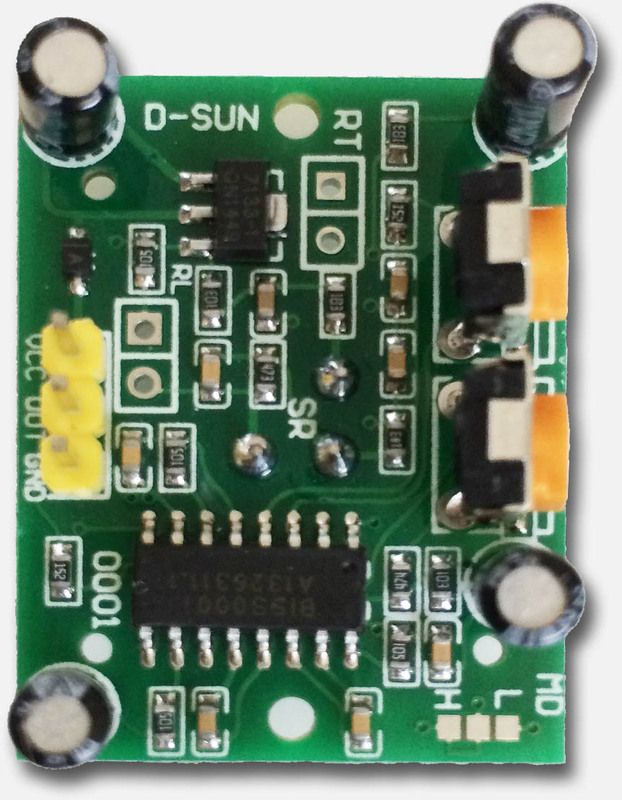 The “Delay Time”, determines how long the PIR will keep the Output “High” (ON) after detecting motion. For example, when motion has been detected, you could set this somewhere between a few seconds (mine has an approximately minimum delay time of 2 seconds) up to a few minutes (specifications of mine claim about 200 seconds). When assembling the basic test setup (above) and the LED seems to stay on forever, turn this dial down – the delay might be too long. The lowest setting, when facing the philips screw of the potentiometer, is all the way to left. When doing your first tests, turn it as low as possible … until you notice there is a need for a time delay. With this potentiometer you can determine set the “range” you have in mind. I have the impression that it regulates how much motion it takes to be “seen”, or maybe more technical terms: how much difference between the two “halves” of the sensor need to see before it’s considered motion. You’ll have to play a little with this to see what is the appropriate setting for your purposes. An increased sensitivity can be beneficial for when using a PIR for long range, say up to 20 feet (6 meters) or more. This can however also cause false positives in smaller spaces – i.e. the PIR might trigger when it should not. A decreased sensitivity is good for a short range, say half of the maximum range or up to 10 feet (3 meters). Which in turn could miss movement at a longer range. Objects further away may need more motion to be detected. First I did set the sensitivity to it’s lowest and walked 14 feet (app. 4 meters) away from the sensor. I had to wave both arms to get detection. After that I did set sensitivity to it’s maximum setting and walked again 14 feet away from the sensor. No I pretty much only needed to move a finger to be detected. Up to you to find what works best for your application of the PIR – with the test setup it’s easy to play and tune. On some PIR’s, they conveniently did not install the jumper (like in the ones I have) – this does not mean that they do not work. Just setting them is a little bit more cumbersome. If your PIR does not have jumpers for this, and just soldering pads, then look closely and you might see that it’s default set to “H”. It took me a while to even see that mine was shorted to “H”. The “L” setting seems to behave a little erratic – when you move in front of the PIR, you will see that it occasionally switches the LED ON and then OFF again. This is called “non-retriggering” – this setting does not or just barely retrigger. When using the “H” (default) setting, you will see that the LED remains ON when moving in front of the PIR. This is what is called “retriggering” and it seems that this would be the most used setting as this seems to behave the nicest. There are 130 comments. You can read them below. What type of sensor is suitable for hands detection directly over the sensor? I would like to create a 5-notes musicial keyboard with 5 sensors, however I’m not experienced enough to know which sensor is suitable for this project. The PIR would detect the finger, but if used for several “keys” then the other PIR’s would detect that finger or your hand as well – probably not something you’d want. For your purposes you could consider a touch sensor (Capacitive touch). I found this article at Instructables, which gives you and intro how to build those and work with those on an Arduino. Good to hear from you Han! As I want to show the “WOW factor” by making musical sounds without physically touching anything, hence I will not go into using touch sensor. Need some guidance on this, thank you. Sounds like the old theraminprinciple. Essentially it worked on a RF field and when you got closer to the wand the load on the RF increased. The circuit worked on having a sensor between the transmitter and the antenna. The closer you got to the wand the current sensed increased. That loading effect changed the pitch through another circuit the audible frequency modulator. Back then the sound effects in movies for especially weird sci-fy movies, such as UFO’s, were really ‘out of this world’ ha! The music of the rock and roll group the Ventures used a theramin for wild sound effects on a song or two. If you are using an Arduino, then you could have it (in setup()) loop until the PIR is ready (eg. switch “off”). 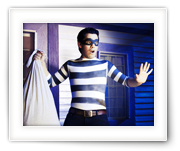 If your car alarm is commercial then you may want to contact the seller/manufacturer. If you want to keep things “touchless” then I’d start experimenting with PIR’s of which you limited the “view”. For example, by placing a short tube or pipe over the PIR so the view to the sides are limited (just an idea). Standard the PIR will have quite a view angle, which you’d like to minimize and this trick might work. it will take a little experimenting, but as you can see above: creating a test setup is easy and dirt cheap. You could even try the sensor by removing the little dome and possibly combine it with a short piece of tube or pipe. Please let us know how your project is moving forward – it most certainly sounds interesting. One more thing, how many sensors can I plug into an Arduino uno? Are there enough to put 5 sensors and 2 speakers and 5 LED light strips? However … you might want to look at a larger Arduino, since the code needed to control all this might be too much for the limited memory of an Uno. So maybe look for an Arduino Mega or something like that. How can i add a on /off switch if i want to turn the led/or alarm off with the person/object in the PIR range. i.e if a cow comes within the distance of the alarm and i want to turn it off with a IR Remote Control or a cord on/off switch. Love some suggestions as im stuck and very new ot electronics. I guess it depends on what you’d like to accomplish. The easiest would be a simple straight forward On/Off switch between the + of the battery and the PIR board. Of course this can be made much more advanced if you’d like to use a remote control (ie. smartphone, infrared, etc). As I’m going to paste a LED strip onto a rotating “mini londen eye”, the wires connecting the LED strip to the arduino will be tangled up at some point of time. I cannot mount the arduino onto the “mini londen eye” because the arduino is also connected to the sensors. Please advise. Wireless. Power the Arduino in the “London Eye” with batteries and connect to a computer or another Arduino using Wifi, Bluetooth, InfraRed or RF module. Since the LEDs only use 4 wires, somehow make copper strips and contacts that slide over the strips while the wheel is turning. Just the first 2 ideas that came to mind … I haven’t tried either. Awesome! Didn’t know AdaFruit sells these … ready made and good to go! Any chance you can share your project when it’s done? I’m really curious about what you’re building. Sure Hans. How can I contact you privately? Hello Hans, does every PIR have approximately minimum delay time of 2 seconds to trigger? If that is the case, I’m not able to mimic a “music keyboard” as I need immediate response from the sensors. I have not bought any sensors yet, hence i’m still doing research on what type of sensors is most suitable. A photo sensitive transistor/diode or and LDR might work better, or at least faster. Both options are cheap too. But you’d need to assume that there is light coming on those sensors, unless a hand or finger is positioned above the sensor and light is being reduced. So at startup you’d need to gage the initial value (which might not be 100% stable with an LDR), and respond when you see it change more than a certain percentage. 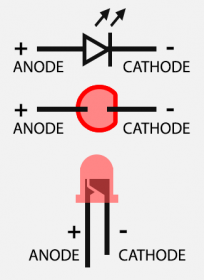 Photosensitive transistors/diodes might be a little trickier to implement though because the simply are ON or OFF. An ultrasonic sensor might work very good as well – I found this article discussing a few options, including an option I did not think about. But they might not work as you’d like them to work. There are quite a lot of different sensors out there, I did see this Arduino Forum topic discussing a short distance sensor. Mouser, a well known component distribution company, has quite the list of components that could help. A sensor like the Leap Motion Sensor would be pretty impressive and cool to use – however, I doubt it’s usable with Arduino and it might take a lot of time on your end to get to to do what you’d want. You’d need only one sensor, but it doesn’t come cheap ($80). Thank you for the links. I could not use photo sensitive transistor/diode/LDR as my project consist of LED lights strips that might affects them. And I will switch off my rooms lights and play with sensors, so it’s like a very dim dark room. I read the links you gave and found a Sharp GP2Y0A21YK IR Proximity Sensor. They said that this Sharp Sensors has capability up to 150cm range detection, which is really nice. Will the lights from my LED light strips affects the IR sensor readings? Will those sensors work after i switch off my room lights? I read about that one too. I am however not quite sure how “far” away you’d like hands or fingers to move. The reason why I’m asking is that if the area to move in is too narrow, then sensors might overlap each other. I have not tested these sensors but I can imagine that a longer distances it’s “beam” would widen, like in a V shape. I honestly have no idea if regular LEDs would interfere, but I would guess not. Did you look at the components at Mouser – they seem to have some pretty interesting ones. Thanks Bob for the tip! can a PIR sensor detect the motion of a object moving before 2-10 centimeters?…if not what is the minimum distance it starts working from? I would think it does detect that yes. I suppose it also depends on the object (size and type of material). The specs of some say “up to 20 feet” and do not state any minimum. I am Rara who is working for company which provide golf swing motion sensor. We outsourced creating motion sensor, but often time occurred errors, so I am looking for company or people who is capable of analyzing our motion sensors, find out problems, and fix the errors. Even though this is not the place to post such a request (the forum would have been better), if anyone feels an expert to help, then please feel free to post a reply here. Great article! i’m very new to this electronic stuff and this got me started real good. One question, do you know a way to prevent the pir from triggering at startup? I’m not using any IC’s just plain components. Well, without making it too complicated, you could add a delay of a couple seconds when “arming” your alarm or powering on the Arduino (in setup()). I do recall a PIR taking a few seconds to “calibrate” when you fire it up (ie. power the Arduino). So a “delay(3000);” (3 second delay) in setup() could do the trick. Thanks for your quick reply. The challenge for this project was to use only simple components, so there is no arduino or pi involved. Was hoping maybe there was some sort of trick to prevent the trigger. I will see if i can find a schematic for a delay. Oh sorry, missed that point, doh! Lesson learned; never try to answer a question when you just woke up and have not had coffee yet . I think the challenge would be that if you add a delay, the delay might be over the PIR, causing it to always delay. Probably not what you’d want. Maybe you’d need something like this, just the reverse version, so instead of make, a break contact, which disconnects your alarm indicator for the first 10-60 seconds after powering on your device. Please post your solution of you found one though! Others might find this helpful as well! There are better ways to start a day… but i really do appreciate your respons! Awesome! It would be interesting to see what you come up with! Does the alarm have something like an LED lighting up or Siren going off? You could think of “disabling” that for the first minute, even when the PIR signals there is motion, prevent the light or alarm from going off. That was a good idea to disable the buzzer…! I’ve found this circuit, and after fidling around with the values I have put this in front of the buzzer, delaying it for 40sec before it is able to react to the PIR’s signal. Soldering the lot on a little board, and on to the next project!! thanks!! I tried finding the schematics, so I could post it here, but the screenshot of the video is kind-a hard to read. If you do have a drawn schematic, please let me know, so I can post it here (no problem if you do not have one). Took some time, but here is the schematic, (kinda… I drew it myself). I have placed this in front of the buzzer so the transistor ( a BC547) acts like a switch for the buzzer. Once the capacitor is saturated, after approx. 45sec it will make the transistor conductive, allowing the PIR to sound the buzzer. So now I have your PIR test circuit with a transistor sounding the buzzer. The PIR is powered through a latching circuit based on a 555. The latching circuit is triggered by a 433mHz receiver, using the linear output, supplying a pulse to trigger the latch. It is my first circuit, and I’m pretty proud too..!! Thanks again for your kickstarting this. And … thanks for sharing your solution – it’s the kind of solution I had in mind as well, just didn’t know the details of the schematic yet haha … nice! Great article! One question… how do I know what resistor is suitable for the PIR if it does not state anywhere what is the expected current. My PIR looks exactly like yours. Do I even need to put a resistor? Thanks! Thank you for the compliment! That’s always appreciated! As for the resistor; it’s only included to protect the LED. Most LEDs these days seem to be able to survive without a resistor, but it’s probably better to include it anyway. 470 Ω is a common value for it. I’m confused about how to test PIR’s exact range , for example : The detect degree range of horizontal and vertical direction. I know we can get the a rough results by body moving . However we need a very exact test reults for different distances(eg: 1,3,5,7 meters) . Do you have any good ideas to help me implement a good solution for get exact test results ? I agree that the range (directions/distance) are a little “soft” and definitely difficult to tune if needed. The only way I know to properly determine the coverage range of a PIR is by simply testing one setting at a time (which is hard with the potentiometer on the PIR). It’s kind-a the same issue one would have with PIR’s that come with conventional alarm systems as well. It takes a bit to tweak it to the right sensitivity. hiii. i got the delay in the operation of PIR On & Off. Actually i dont attached any delay in programme still the led is not change its position for around 4 seconds of operation. can u suggest me some solution for it? If you mean that at startup, the PIR takes about 4 seconds to “warm up” then I would not know a work around for that. The PIR has to adjust to it’s environment when powered on, which takes a few seconds. Dear Hans, My name is Ashish and I am doing some research on Intrusion Alarm Systems, a typical kit includes Smoke sensor, PIR motion sensor, Door sensor, siren and host panel. There are companies who sell such systems for 300$ and then there are who are providing it for 30$!! I understand that a lot of factors come into play; however given that the technology have been around since quite sometime and there so much one can do to improve the results, why such price variation? The reason I am asking these questions is because I am getting a complete product KIT customised from a Chinese company to offer the security solution in service based model. If possible and if you have some spare time, can you provide me your email address? I would like to explain more about the kind of customisation I am getting done and technical challenges I am facing and would like to have your expert opinion. I woud assume that there might be a difference in quality, but it might also depend on wether or not there is a case around it. I’ve played with $1 PIRs and they work just fine for me. I also tried a more expensive ($150) PIR, the difference being that the expensive one had a nice case around it. You might have to test a few to see if there is a significant difference. I couldn’t see a difference between the 2 I tested (the $150 went back to the store hahah). Thanks Hans for taking time and answering my question. This is really helpful, cause I know that we can take a chance with cheaper PIR sensors (yes we have to test them properly! )… Really appreciated. Do you also get involved in Alarm panel to CMS communications area.. there are many ways and many protocols, and I am quite confused with all that… and wondering if you can help me there as well? Thanks Hans, its good to hear that you want to start a project in this area. If you need any help to understand the available technologies, methods, pro-cons etc… let me know, I have done a lot of research …although i am still confused with some of the protocols. First of all, the PIR’s I use costs $1 at eBay or AliExpress, when I bought 10 at a time. Worth looking into? Second thing to think about might be something like a capacitor … I’m not an expert, so I’m not sure if such a filter will do what you want. Now as far as the signal goes; if you’re using something like an Arduino, you might be able to catch this in code as well. Can a PIR sensor can be adjusted to sense humans maximum at a distance of 10 – 15cm? If not are there any sensors to do so? Also are there any sensors (PIR or any other) which has a straight constant width detection range and not increasing for the detection of humans? I’m (of the top of my head) not aware of any PIR sensors that meet your specific demands. What you could try however, is remove the plastic “dome” around the sensor. It will narrow down the width. Are there any other sensors which meet my demands? But: please post here if you find any! I’m sure others might be looking for that as well. I just had not had the time or need for it. When there is a motion LED is on. but when there is no motion, it turns the LED for about 5 seconds and after about the same time it turns it off. This happens always and periodically when there is no motion? what is wrong? Thank you. But I checked with 3 sensors all have the same problem. I checked with different sensitivity but still have the problem. I am using Adafruit Huzzah. any suggestion? I have never used the Huzzah, but it sure looks interesting! I don’t think this conflicts with using a PIR though, but to make sure you could make a simple setup (as shown here) to see if the bad behavior of the sensor still occurs … this way we would eliminate influence(s) from the Huzzah. Hans, Have you ever heard / knew if domestic lizards may trigger the PIR sensor?? Domestic lizards can walk at any surface and I won’t rule out the possibility of them walking over the sensor itself. If that is indeed the case, how can we avoid that? You could build a cage around the sensor from, for example, chicken wire or something like that. Enough holes in it to detect motion, and since the chicken wire cage is not moving, the sensor will not “see” it. :) :) :) That’s indeed good idea, I will consider it if I face this issue in real life :). I am in serious trouble here, I tried to use PIR with raspberry pi for a project to detect motion and the sensor is detecting the motion but the problem is that it also triggers without any moment when faced towards wall with some distance. It keeps triggering two times in each minutes like in 6th second and 51th second in each minute continuously. And the problem is I don’t have other pir sensor to test with and the cheaper one comes with around 10$ for each with minimum of 2 day of delivery . So I want help as I am absolute beginner for these sensors. Please help here. You could try changing the sensitivity, and see if it improves the situation. Additionally, either the PIR is defective (which I have not encountered yet! ), or there actually is something triggering the PIR. Keep in mind that heat sources and critters can trigger the PIR as well. Another reason that might trigger the PIR is a not so stable power supply (effectively resetting the PIR). Also note: if you buy a 10-pack, for example this one at Amazon, then the price of a single PIR drops well below $2. I got it okay now , Once I changed from PI 3B to PI 2B it worked just fluently and I came to conclusion that the PI 3B with a PI NOir camera with IR lamp attached to it can’t provide enough power to pir sensor as it is more power hungry. So if any one have come across such problem it is not on your sensor its the problem with PI 3B which takes too much power source and the normal adapter can’t deal with the PI 3B. And sorry Hans but the Amazon can’t deliver in my country (Nepal) and yes I think we have to pay double the amount for these machines for atleast few more years. 10$ for sensor 68$ for pi and around 52$ for sainsmart 5mp camera but still pi is pi just amazing to explore. I’m happy to hear you’ve got the issue resolved. Nice! And thank you for posting it here as well! can anyone tell me what is the minimum difference in IR needed by a PIR to be triggered. I am thinking to use it to detect movement of small insects that emit a tiny amount of IR. I would not have an idea how much change in IR would trigger a PIR, but you can set the sensitivity and experiment with that to avoid false positives because a bug happened to walk by. this is encouraging, I will definitive get one and test it modifying the sensitivity, thanks! There is diode in the circuit, so you cant feed it using 3.3v, because the voltage will drop to 2.7. If you want to use 3.3, just remove diode and short it, also jumper from vin to vout in regulator. If in front of pir sensor the small object moves then pir work or no….plz expain me in detail…..
Ehm, I have no idea what you mean? I have the task of checking weather a person would be available at his cubicle/desk or not. This is to be achieved by using the application of IoT and raspberry pi 3. As i shortlist my possible sensors, PIR being the front runner, I wish to position my PIR sensor below the table. Thereby detecting the IR emitted off of the person close to the sensor. However, I had a few concerns regarding the sensitivity, and if it would be more effective in the given application without the fresnel lens(given that i require it to be unidirectional). Also, I’m open to suggestions regarding the usage of PIR. Needed a second opinion on this. Also, if you intend to use this for multiple cubicles, and you’re looking at an IoT approach; consider using ESP8266’s instead of a RaspBerry Pi. The can be used as an Arduino with WiFi right away build in and they are less than 1/4 of the price of a Raspberry Pi. (example link: Amazon). the PIR sensor, which causes a positive differential change between the two halves.”, which like you said can only be perfected using intensive testing. Your thoughts ? Also, is price the only advantage of the ESP8266 as compared to the raspberry pi ? Of the top of my head, I would not know a simple to implement alternative. I would however test the PIR first before concluding that it won’t work. I have not tested this and I would assume that it will be very hard for a person to not move, additionally add some logic to your code that assumes nobody present in the cubicle when there was not motion detected for say 20 seconds or a minute. Again; testing will give you an insight in what would work best. Thanks a lot. That was quite helpful. One more thing I’d like to know, was on how to go about to increase the time delay required for the pir sensor to switch the circuit off once it does not detect motion. This would be required in order to improve efficiency in terms of the output. Would it help if I connected two Pir sensors in parallel to detect motion, thereby improving my output ? I’m not understanding your question – You mean “shutdown” the setup, for example at night when there is nobody in the cubicles? I am doing my project using pir. you should see the “output” pin as a switch pin. 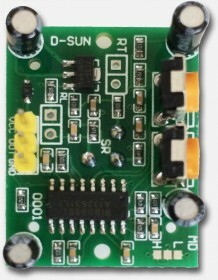 When the PIR is triggered, power from Vcc (left of the output pin, connected to the “plus” of the battery) will be directed through the Output pin, supplying enough power for example for an LED. The other pin of the LED is connected to GND (in this case: the “minus” of the battery). If this is what you are already doing, then consider trying another PIR – yours might be faulty. I did not follow any IEC or BS standards. Any specifications mentioned are manufacturers specifications. I wanted to test pir sensor with an IEC or BS standards but don’t know how to get the correct standard for that. Do you have any suggestions? apologies for the late reply – regular work has been dominating my daily life the past weeks. Hey, can you explain more about the adjustment knobs? One is the time Delay; or how long the PIR will keep the Output “High” (ON) after detecting motion (how long will it flag a change as “ON”). The other one is for Sensitivity, or how sensitive (by changing the range – or how far it looks) it is to motion. Can I use PIR sensor to detect the objects like crinkled paper. whether PIR sensor detect those kind of object. I have yet to play with Audio and the Arduino, but maybe a project like this one (Arduino Audio) might get you started. The Arduino website also shows a project that helps you create audio on an Arduino. 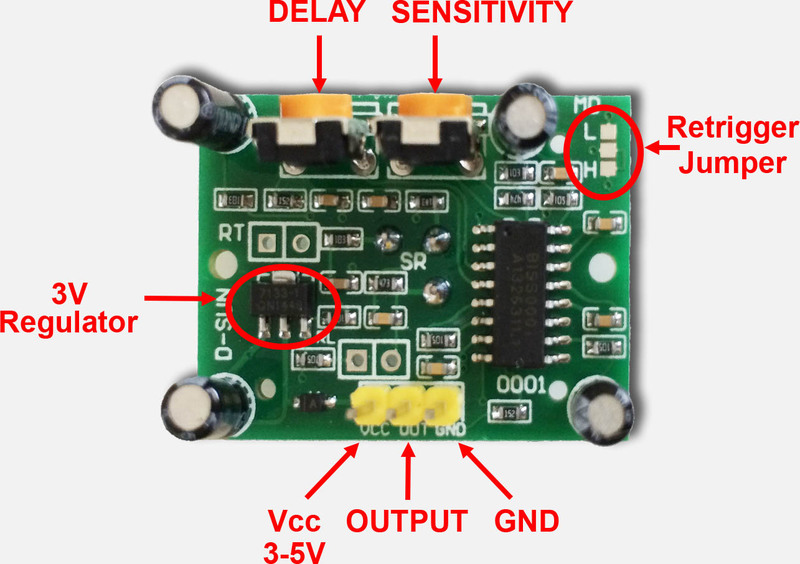 In our prototype,it is found that the angle of detection is less than 50 degree,can anyone help how to take care about this while designing using the PIR sensor,like placing the PIR Sensor(On which layer of PCB)LIKE THAT. You can kind-a set the “distance” with the sensitivity dial – but it’s not very accurate and technically not for setting the distance – more so for how much change needs to be seen before it is seen as motion detected. I am having problem with association. Please HELP ME: I have associated my lights with my PIR sensor so whenever it detects any movements it opens up the light but after 3 minutes it closes it. Now my problem is that when this PIR sensor closes the light then it didn’t come back to its normal position till 3 minutes and after 3 minutes it again start detecting motion. like for example> i went to my washroom motion sensor detects me and opens up the light but after 3 minutes it closes it since i am in the bathroom so i wave it towards motion sensor so that it reacts again and open up the light but it didn’t till a few minutes then reacts and opens up the light. What should i do? you’ll need to implement a delay-off timer. This goes beyond the scope of this article … but you can either design one, or buy specific modules for it (like one of these or one of these). For example this module is only $3 and can delay 220v 0-99 minutes. I’m not 100% sure what you mean, but if you mean that the wire from PIR to Alarm is too long and the signal degrades too much, then you may want to use a transistor to “boost” the signal. I did find an example at StackExchange. Here they use one or more transistors to “boost” the signal from 10mA to >200mA and even 1A. My pir alarm is wireless. The distance between point a and point c is too great so was hoping to find something to go at point b to bounce the signal from pir to the alarm box across a greater distance than they are designed for. My idea is to take a second alarm box and remove alarm sounder. Attach the signal sender from a spare pir in sounders place. 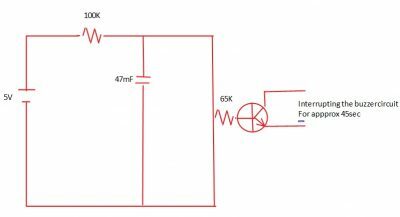 Creating a middle distance receiver and sender in one. Does this sound feasible to you? What type of wireless signal is being used? If it’s a radio signal (eg. WiFi, Bluetooth, 2.4Ghz RF, etc), then you could consider increasing the size of the antenna. I’m not sure if this is a homebrew alarm (allow more modifications) or a commercial alarm (making it much harder). Setting up a “repeater” (as you suggest) may work as well, but … I wouldn’t label it as the most reliable way to do this and you’d need to know details about the wireless signal, so you can make a receiver and a transmitter (the “repeater”). a PIR will not be able to “follow” any object. It just detects that there is motion, not where or in what direction it may be moving. So I don’t think a PIR is what you’d need for your project, unless you use multiple PIRs and even then I’m not sure it will be useful for your needs. I think using Ultrasonic detectors may be better, but I haven’t played with those yet. See this example project. As for your question; under normal circumstance this is not possible with a PIR. To detect something like that you’ll have to combine multiple PIR’s each with their own “viewing area”, so that when certain PIRs trigger, you’d “know” that you’re roughly in that position. I’d recommend reading that example project where multiple PIRs are combined, which will give you an idea of what I’m talking about. In this example you’ll see that the designer created a “tunnel” or “view” for each PIR by using walls between the PIRs. well, I’m pretty sure there are several different models when it comes to PIRs. So the short version of the answer would be: I don’t know. I can imagine that they have used a cheap PIR like the one shown in this article. Since the camera is already useless at this point, you could try one of the ones used in this article – I did see a few at Amazon for about $8 for 5 PIR’s. b) they sensor (the metallic round item with a square on it – kinda looks like a transistor) is fixed on the main PCB of the camera. In scenario A, you could try to determine what the 3 pins in the camera are. 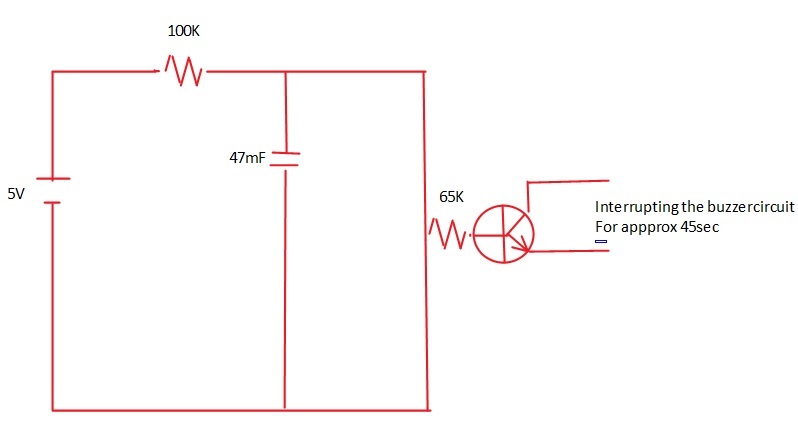 One pin is ground and another is power (typically 5V). Whatever pin is left would be the OUT signal of the PIR. Scenario B maybe a little trickier; you’d have to remove the sensor of the cheap PIR’s and solder them into the camera. Finding the pin layout may be challenging though. I think the sensor itself has 3 pins as well. The PIR is on the mail PCB of the camera and looking at the back of the board it looks like a 3 pin (solder points). The only thing is that this PIR looks to be 2 parts. The top part is like the one on this site in Fig 2 and it is 6 mm in wide and there is a black part on the bottom that is 7 mm wide, the height is 1 cm in total; 3 mm is the silver part like the one in fig 2 of this site. Not sure what the black part sitting under the PIR is though? Not sure if there are PIR’s out there that utilize 2 parts – then again; I haven’t seen all of the possible variations either . The sensor looks similar to the one in the cheap one I’ve used in the article. The rectangle spot (detection area) is a little bigger than the one I have though. So you could try swapping them out and see what happens. I suspect the model in your camera may be a little more sensitive than the cheap ones though. When swapping them out, you may want to use a multimeter to determine ground and +5V – just to make sure the pin-out is the same. When removing the current sensor (I honestly have not seen one get broken yet); you may be able to see the sensor type and number, which may be helpful in finding a replacement. Unfortunately, I do not know the device you’re using. I just replied to your email as well, but had not read this comment yet. I suspect this feature is used if paired with an alarm system (set it to ON). Not sure why they’d even have a separate switch for it. Thank you anyway.It is a PIR supplied with D3D WI-FI SMART ALARM SYSTEM.Marketed in UK/EUROPE,ASIA and AUSTRALIA and USA+CANADA according to the brochure.Probably manufactured in CHINA.Bought it in Amazon.in.Not much information online.I assume you have seen the photo of the device sent as an attachment in the E-MAIL. I received your email and replied. I’m just replying here as well for others to see the response. I suspect the PULSE jumper needs to be set to ON in order to communicate with the Alarm system. The manual (picture) doesn’t say anything useful about it. Yes,I bought a HOME SECURITY SYSTEM consisting of a CONTROL ALARM UNIT, 2 DOOR SENSORS and 2 PIR SENSORS.PIR sensors triggers the ALARM UNIT in both the position of PULSE switch -either OFF or ON.It communicates in both the position.I could not make out any difference.Hence all these my questions and queries. sounds like your alarm system has PIR units that can be used for other purposes as well – and the manual most certainly is far from clear or complete. Good news is that it works either ways for your purpose haha. But I do understand your confusion – I wouldn’t know what to think of it either. Thank you.If I come to know anything more regarding PIR from other sources,I shall let you know. Thanks Ramesh, sorry I couldn’t be more helpful. I’ve a small query if anyone of you can help with. Recently I bought PIR sensor from online market. This is the first time I’m dealing/learning electronics. 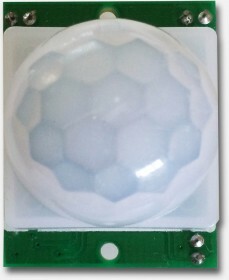 PIR sensor contain BISS0001 chip which has 16pins. In my case pin 1 and 2 are soldered together. I’m thinking to attach this with arduino board to make a project but I’m not sure if this will cause issue as pin 1 and 2 of BISS0001 are soldered together. Will it cause issue if I use this PIR or I should buy new one? sounds like it’s using the same chip as the PIR in this article. I’m not sure if pin 1 and 2 will be problem – you may have to take a look at some of the schematics out there (Google). HiI made the exact connections as mentioned in this article,but the light doesn’t seem to turn off. It always stays on. What may be the problem? Kindly respond. Thanks in advance!! there can be several reasons why the light remains on. A simple test could be: cover up the PIR with for example a towel. Switch the setup ON and wait for about a minute. If it still stays on, then there may be something wrong with the PIR, the wiring, or your PIR has one or the other jumper set wrong. I actually have set the settings to the lowest(turned them both completely to the left). I also waited for more than a minute to allow the sensor to get used to the environment. I did the test you had suggested with the towel,but to no avail. It still remains on. As for the wiring, I have given them right. I can perhaps send you the pictures via email,if you provide me your email. I’ve given the jumper(trigger) connection to high and the middle pin. I’m working on a home automation project with arduino and pir sensor, so this component is of utmost importance. Maybe the sensor is defective. If you have more than one PIR available, then please test another one (they are very cheap after all). It sounds to me that the PIR is defective – but I could be wrong of course. Thanks Han, great article. Is there any way I can detect if someone is approaching or walking away using a PIR sensor? Is the voltage output from the PIR sensor a function of distance? ie. I’m looking for a way to not only detect that there’s motion, but also to detect if that person is moving toward the sensor or further from it. That is an interesting question … as far as I recall, the PIR by default only triggers (eg. On vs Off) and therefore does not indicate something like a “strength” which could indicate distance. This doesn’t mean the actual sensor on the board cannot do this – I just don’t know (I do suspect it does internally use some sorts of signal strength and triggers if it exceeds or drops below a certain level). What may be a better solution, but I haven’t looked much into this yet, is using an Ultrasonic sensor. This may be worth looking into.